Laura Guzman, director of homeless services with the Mission Neighborhood Health Center, in front of a “No Monster in the Mission” banner in City Hall on June 9, 2016. Photo by Joe Rivano Barros. The first volleys were fired in a renewed Mission District housing battle on Thursday, as dozens of activists rallied at City Hall against a recently-resurrected housing project at 16th and Mission that would be the largest planned for the neighborhood. It’s been just a week since the last pitched battle over housing in the neighborhood — a months-long affair concerning a 335-unit housing project on Bryant Street — ended in a loss for activists when the project was approved by the Planning Commission, though not without significant concessions from the developer. 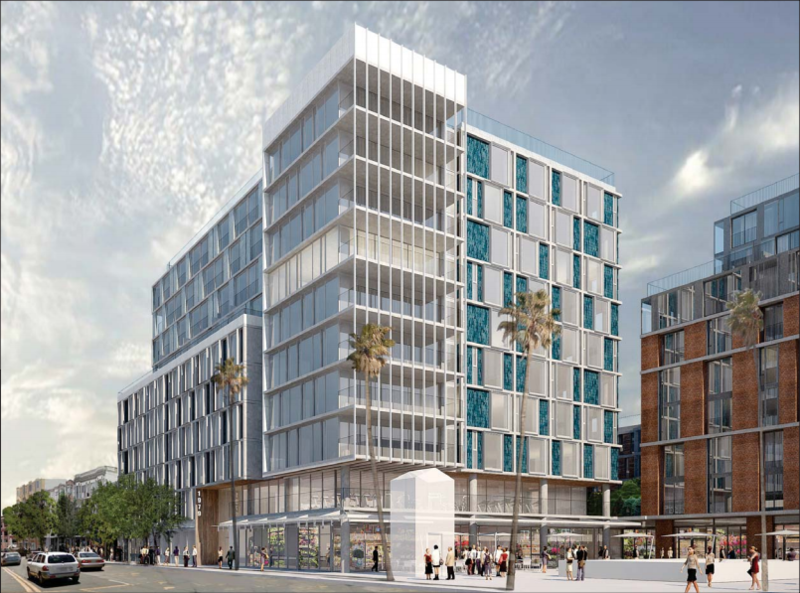 But activists are back on the offensive, with some of the same opponents to the Bryant Street project vocal on Thursday in a fight against the so-called “Monster in the Mission,” a 380-unit development at 16th and Mission at 1979 Mission St. The project — developed by Maximus Real Estate Partners — would also create a ground-floor market-place and house other businesses in three mixed-use buildings rising around the northeast Bart plaza on the corner. Ostensibly there to address the environmental impact of the project, speaker after speaker chose instead to speak of gentrification, displacement, and shadow in a bid to convince commissioners to kill the project when it eventually goes for approval. 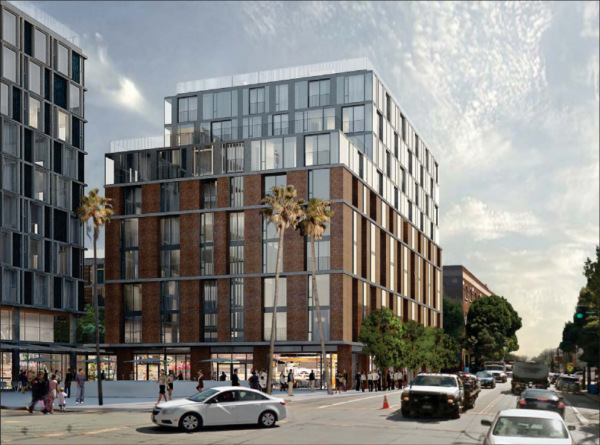 “The environmental impact report doesn’t talk about the effects of displacement, specifically [single-room occupancy] tenants,” said Chirag Bhakta, a principal opponent of the project and member of the Mission SRO Collaborative. Bhakta said several SROs in the area of 16th and Mission have been renovated and now use some of their rooms for high-end tourists, which he fears could lead to the displacement of the low-income and rent-controlled tenants in those hotels. Such hotels are allowed to keep a portion of their units for tourist rooms, but Bhakta fears the demand for the tourist rooms will lead SROs to illegally convert their non-tourist residential rooms — usually occupied by low-income tenants. “This is an impact, it’s a socioeconomic impact caused by luxury development,” he said. Mock-up of the 6-10 story building at 1979 Mission St., as seen from the corner of 16th and Mission. Larry Del Carlo, the community liaison for Maximus, fought back against attempts to characterize the project as a displacement bomb and echoed praise for the transit-rich location. And Jonathan Bonato, a San Francisco resident who said he was homeless for years and used to live a few blocks from the project site, said he welcomed the new development and thought it might transform a crime-heavy area. That was met with boos and hisses from audience members, many of whom belonged to the Mission SRO Collaborative. 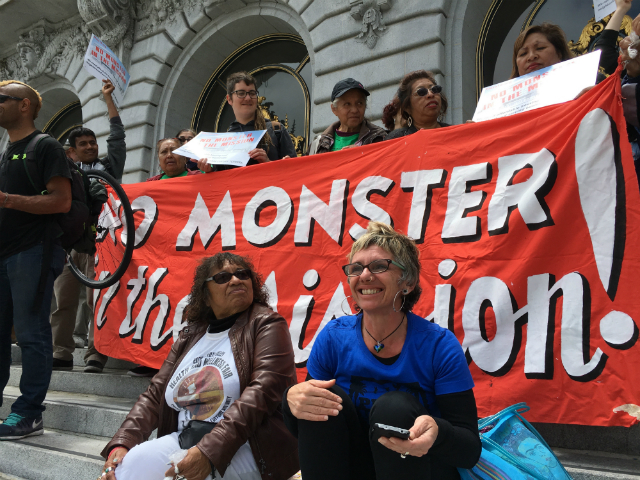 Some 50 opponents to the project held a press conference on the City Hall steps ahead of the hearing, saying the development would exacerbate gentrification in the Mission District, particularly in an area near single-room occupancy hotels, a homeless shelter, and cheap grocery and liquor stores. Latonya Jones, a member of the Mission SRO Collaborative and an SRO tenant herself, said market-rate housing in the Mission District would first affect “the poor, the working class community” in the area. She said rooms in SROs around 16th and Mission are disappearing rapidly to home sharing platforms like Airbnb. She said a new market-rate development could spur tourism interest in the area and accelerate the illegal conversion of residential rooms into tourist rooms. At least one SRO hotel in the area — the Hotel Tropica at 663 Valencia St. — advertises several listings on Airbnb going from $198 a night for a one-bedroom to $298 a night for a two-bedroom. Several more — like the Hotel Sunrise at 447 Valencia St. and the Union Hotel at 2030 Mission St. — can be found on other hotel rental sites for about $100 a night. “We will be gone if that monster gets built,” said Laura Guzman, the director of homeless services at the Mission Neighborhood Health Center three blocks from the project site. Guzman said she was particularly concerned with the number of homeless people who convene in the area, saying gentrification would pose a mortal threat. “Our homeless community will be displaced, will be gone, will be killed,” she said. The idea of towering complexes in the middle of the Mission District — two of the buildings in the current proposal will be 10 stories and another five stories — is concerning for opponents because of a shadow that would be cast on the playground of Marshall Elementary School nearby. The developer has agreed to raise the school’s playground by 15 feet to mitigate the impact, but opponents are still resistant. The 7-10 story building on 16th Street Street as seen from 16th and Mission. The alternative proposal — presented to the Planning Commission after the rally outside City Hall — was true to those concerns and suggested that two of the buildings be lowered to eight stories and that a third go to two stories. That would likely shave off dozens of units from the total, though activists did not give a unit count for their proposal. The project still needs final approval from the Planning Commission, but few expect this to go quickly or smoothly. Mock-up of the 4-5 story building on Capp Street. What about the environmental impact of less feces, urine and used needles on the street? I think it’s the first time I’ve ever heard someone worried about cheap liquor stores being displaced. The fact of the matter is that the city is already gentrified. Rents are high in all areas. SRO’s will continue to get converted regardless of whether this gets built or not. Do you want to replace the low income housing that is goign away or do you want to keep your drug ridden, violent, piss-stained plaza? Public commons can be cleaned up. Hideous developments like the above are soul-crushing and community-destroying. Sorry, that’s not our Mission. To say something is not “ours” is a bit arrogant. Who “owns” the mission? Neighborhoods and cities constantly evolve and grow. While encouraging proposals to assist those that wish to remain living in the neighborhood are a fantastic idea IMO, opposing new buildings for fear of displacement is short-sighted and counter productive to the long term cause of displacement in the first place – not enough housing supply for demand. Opposing this project will not prevent displacement. I also spoke in favor as a neighborhood resident living a few blocks from the site. It seems to me most people in the Mission think this is fine, but you’re not going to wait hours at City Hall (due to unpredictable schedules) just to say that. Especially if you work 9 to 5. I encourage neighbors who support this project to politely email the commission and ask them to move it forward and state why you support it. While not as impactful as going in person, they do read emails. Not building this housing won’t stop people with well-paying jobs from wanting to live in SF. If we don’t build dense housing near transit like this, where will that demand go? Some of it will go to parts of the city and region that have poorer transit connections. That will worsen traffic for all of us. Some of it will still go into the Mission, driving prices up and increasing the temptation to evict long-term residents, as more people compete for the same number of homes. Opposing this development is really short sighted. Hopefully the commission won’t be swayed by these loud voices that want to hold our housing and transportation goals hostage. 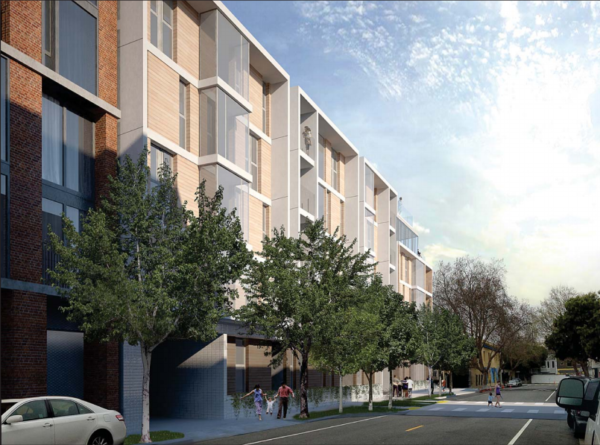 I’m a Mission resident and I want this housing in my neighborhood – the sooner the better.